In late 2016 Page Macrae Engineering was contracted by Ecolab to build four stainless steel tanks for their facility in Hamilton. The stainless steel team fabrication built the tanks to their full height of 7.5m within our Mount Maunganui workshop before transporting each tank to site for erection on the concrete foundations. Along with the four tanks, we fabricated the pipe bridge sections in our workshop. These oversize sections were transported to site for our site team to install. The Page Macrae Engineering Projects team worked closely with the Stainless Steel department on this project. Page Macrae Engineering was awarded the contract for the fabrication and installation of the iconic 10 million litre fuel tank at Gull’s Mount Maunganui storage terminal. Constructed to API650 Standard, the 10 million litre tank was built using Page Macrae Engineering’s unique jacking system. The tank was completed in time for the official tank opening on 19th April 2013. Page Macrae Engineering was contracted by Fulton Hogan to construct an 11,000m³ API 650 Storage Tank and full plant upgrade of their Mount Maunganui bitumen plant to meet environmental and health and safety standards. The project involved demolition of much of the existing plant followed by the installation of new plant and equipment. This included construction and erection of several pipe bridges, replacement of thermal oil and product pipework and installation of mechanical equipment associated with the plant. 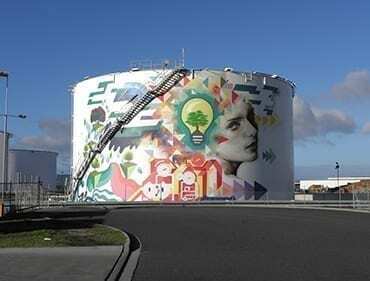 Due to its prominent position on Mount Maunganui’s main industrial route from Port of Tauranga, the Fulton Hogan tank and plant will remain one of our more iconic projects. The storage tank and the plant upgrade was delivered on a tight timeframe so Fulton Hogan could meet its obligations to their customers.